Looking southeast is Red River station in Texas -- the Chisholm Trail entered there and come out in Indian Territory here at the Fleetwood Community. Millons of cattle crossed here on their way from Texas to Abilene, Kansas and other points off the Chisholm Trail. The cattle were so thick at times in the river crossing that a cowboy could walk across the river on their backs. Northwest of the site on the I. C. McGinnis land in a branch of Fleetwood Creek are wagon wheel ruts in sandstone that are very destinct today. Highway US 81 at Terral, Ok turn east on Apache, follow road, road turns into Fleetwood Rd. go about 5.5 miles. 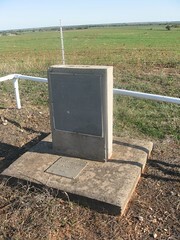 Marker is on south side of road. 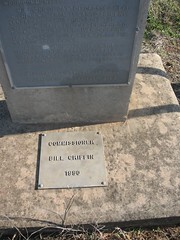 This marker is on the southeast corner of two markers.